It is bedtime already but my agenda looks way too loaded for tomorrow. Today was long enough already but this column needs to be written and on its way. I started the day with sewing on daughter Verena’s dress that she needs for her baptism on Sunday. I have the dress almost done. While I was sewing the girls started peeling and chopping tomatoes for salsa. We ended up with 58 pints of salsa. We also canned 20 quarts of tomato juice to use up the rest of the tomatoes from our garden. On Saturday Joe and the boys cleaned up most of the garden and tilled it. We still have peppers and tomatoes out there. We had our last meals of sweet corn for this season. We have cabbage and red beets to use from our harvest. Although it is nice to have garden goodies, it is also nice to have everything coming to a close for the year. It makes it harder to be preparing for church services while canning season is in full swing. Our second time of hosting church services will be Sunday, September 10. Daughter Verena and another girl in our church district, Anita, will be baptized, Lord willing! September 10 is also granddaughter Abigail’s first birthday. Daughter Elizabeth will bring a cake for her so we can celebrate her birthday. She will have a small one for Abigail to dig in and then a bigger one for the rest. It will be fun to watch Abigail tear into a cake. On Labor Day we were all home except son Benjamin who spent the day with our nephew Henry. I sewed Verena’s dress, cape and apron that she needs for Saturday. It’s for her friend Rosanna’s wedding. Verena is a tablewaiter and will serve the bridal party. It will be a full weekend for her. Sunday evening we attended a birthday surprise supper in honor of niece Elizabeth (daughter of sister Emma and Jacob). We all gathered there before she and her special friend Manuel arrived home. Friends and family gathered in their pole barn. When they came home and pulled up to the pole barn the overhead door was opened and we all yelled, “Happy Birthday”! She was surprised and a little speechless for a while. We were served a delicious supper of breaded mushrooms, jalapeño poppers, French fries, and haystacks. A variety of desserts were also there with everyone bringing a dish; fresh fruit, pies, puddings, and cake. People played a variety of games and enjoyed singing. Elizabeth is 21 now. Time does not stand still. And now I have sad news. A friend from Hicksville, Ohio, that grew up in the same area Joe and I did, passed away. Mary, age 51, lost a two-and-a-half year battle to cancer. She left to mourn her husband, Marvin of 30 years, six daughters, four sons and eight grandchildren. What an empty space there will be. We have plans to go to the visitation tomorrow evening. Our sympathy goes to her family. They need our prayers as they live life without a wife and mother there. God makes no mistakes. May God be with them through this heartbreaking trial in life. Our thoughts and prayers go out to all the people affected by the floods from hurricanes and also the fires that are raging throughout the west. I can’t imagine how hard it must be to pack up and leave your home not knowing if it will be there when you return. Everything happens for a reason. We don’t always understand why but we know God is in control. Let us keep everyone in our prayers. God’s blessings to all! 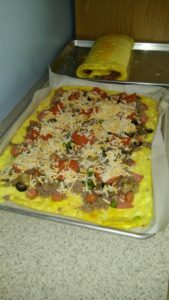 This week I will share the recipe for ham and cheese omelet roll. I shared this recipe around nine years ago but I want to share it with my new readers and for anyone that might have missed it. It is a favorite of ours. We like it with breakfast sausage gravy on top. Enjoy! Additional fillings as desired: mushrooms, peppers, bacon. Preheat oven to 375 degrees. In a bowl combine cream cheese and milk; whisk until smooth. Add flour and salt. In another bowl, beat eggs and then add cream cheese mixture. Cut wax paper to fit jelly roll pan. Pour mixture into jelly roll pan and bake 30 to 35 minutes or until puffy and golden. Meanwhile, chop ham, onions and anything else you want to add (mushrooms, peppers, bacon, etc.). 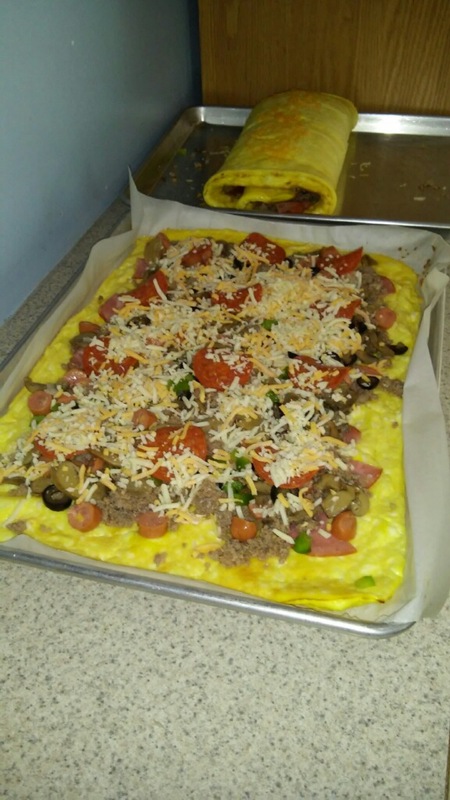 Remove omelet from oven and spread with mustard and half the shredded cheese. Add ham, onion, and any additional fillings then sprinkle remaining cheese on top. Roll up in jelly roll fashion removing paper as you roll. If desired, garnish with additional cheese and let stand 5 minutes until cheese melts. Serve with salsa or cheese sauce. Previous PostWhy work so hard cleaning for church services?Next PostWhen does Mom get her bubble?